This fad has come and gone before, as companies use whatever means possible to attract the best employees. 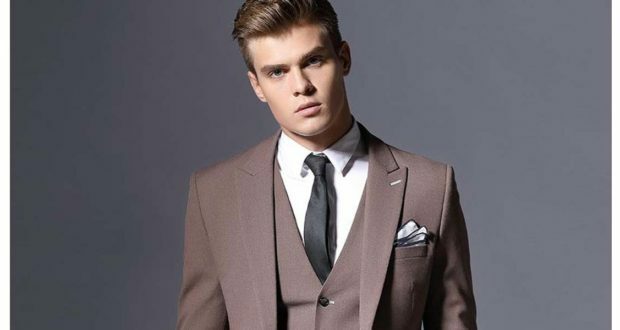 One of the most popular perks is casual dress, especially for men. Wearing jeans and a golf shirt to work at Goldman Sachs is not a new concept. In the go-go days of the internet revolution, where the best and brightest were leaving Wall Street, ala Jeff Bezos, firms used casual attire in an attempt to stop the exodus. However, when that bubble busted, Windsor knots were again being tied all over Manhattan. What comes around, goes around. Adjusting to fashion trends on the fly is a difficult business. Just ask Jos. A. Bank, and its sibling, Men’s Warehouse. The trend to khakis and open oxford shirts is hitting the parent company, Tailored Brands, in the proverbial pocket. The chart below depicts the negative trend. If you read between the lines, you will see that the changing demographics lie behind this subtle apparel change. While Goldman Sachs conjures up the image of country club elderly men, it couldn’t be more different. More than 75 percent of Goldman employees are members of the Millennial or Gen Z generations, people born after 1981. The young on Wall Street control the fabric of dress currently. If you venture off of Wall Street, you will find the casual dress trend continuing. Target Corp., the Minneapolis-based retail giant, has followed suit (pun intended) and has allowed its non-floor workforce of some 14,000 people to wear casual clothing to work. 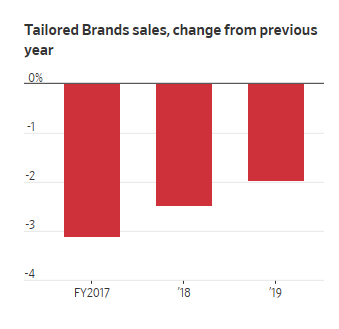 When firm after firm decide to go casual, the numbers increase and the deleterious effects are felt in the U.S. men’s suit market. The sartorial splendor that is taking place in the work world may likely stick this time around. This would have an enormous financial impact on the retail apparel world. We are already seeing some of the shifts. At Jos. A. Bank’s newly renovated Midtown Manhattan store, the ground floor is dedicated to jeans, khakis, dress shirts and blazers. Suits are relegated to the upper level. Macy’s is picking up on the trend, by moving into more custom tailored suits, and less off the rack business suits. The clothing market is brutally competitive from top to bottom, and any changes will likely eliminate those who fall behind these trends, and reward those that are trendsetters. With the baby boom generation in full-retirement mode, the classic business suit may have worn out its welcome, in exchange for sneakers and athletic pants. Class-Action Suit Against Google – Gender Pay Discrimination?